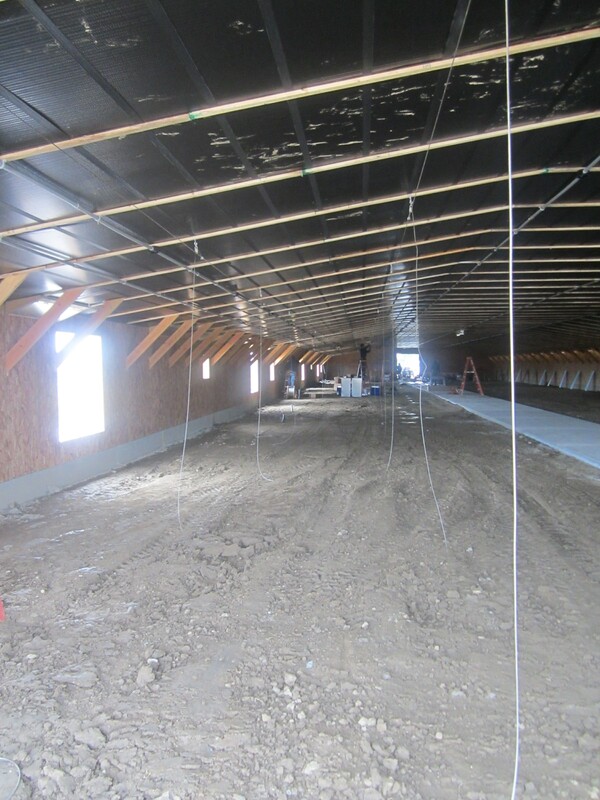 Now that the exterior of our breeder house is complete we’ve headed inside to construct a cozy home for our flocks. That’s right, we’ve changed hats from chicken hatchers to interior designers. 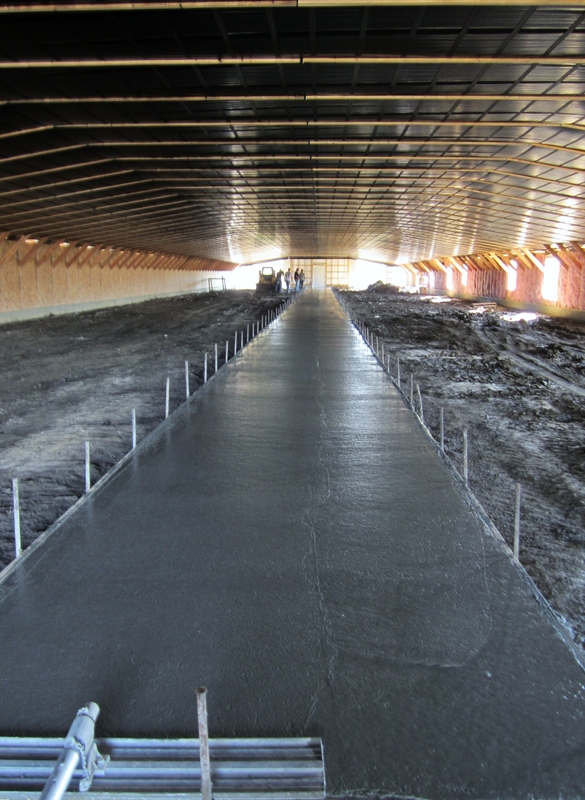 Smack down the middle of the entire house, we poured a cement walkway for people traffic. On either side, we have plans for individual pens for each breed. 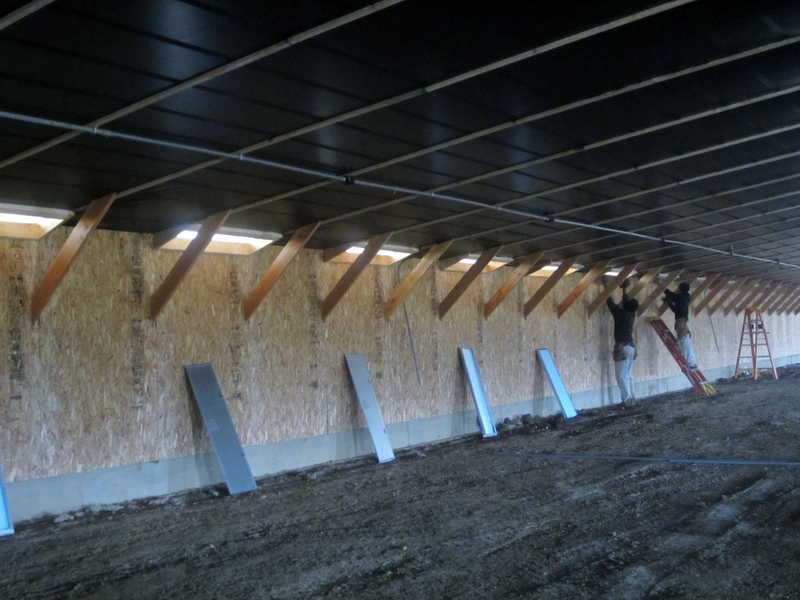 While the concrete hardened, we got busy finishing up the interior walls with plywood, followed by ventilation installation. Fresh air is so, extremely important in any coop! 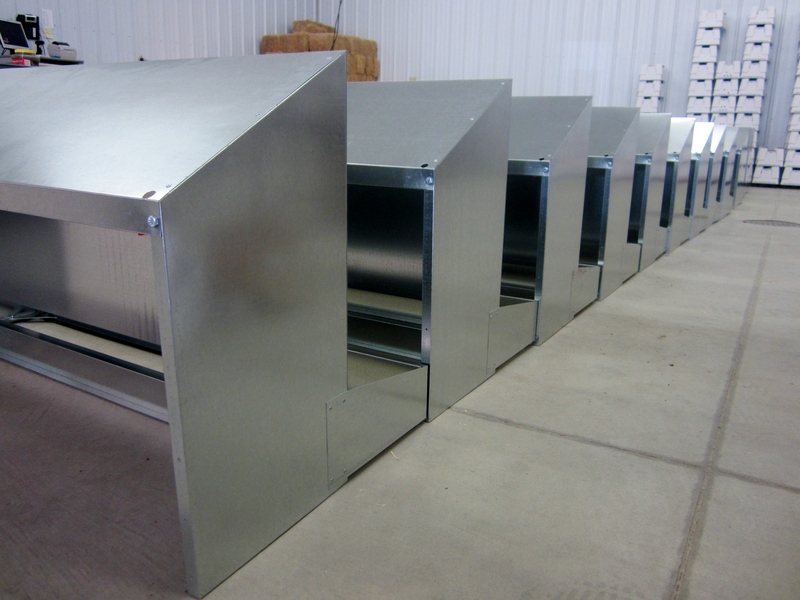 We hung dozens upon dozens of vents to keep the air circulating and keep our hens happy. In addition to a great ventilation system, we installed an extraordinary feeder operation. We can raise and lower it as the birds grow. This cuts down on changing out the feeders as the chickens mature, like many of you have to do. Obviously, there are lots of pullies needed for this to work. Notice all of the braces hanging from the ceiling in the photo below. They are attached to the pulley system on one end and will attach to the feeders on the other end. This will be one continuous feeder trough carefully designed to run through each divider wall so every pen has access to the same feeder. Those aren’t streamers, they’re the beginnings of the feeder system going in. Separate from the chicken housing area, is an “Egg Room” (Yes, we’re good at coming up with clever names for various areas of our operation.) The “Egg Room” will contain the eggs waiting to be picked-up for delivery to our hatching facility. We’ll collect, count, and sort them daily, but only pick them up once a week. 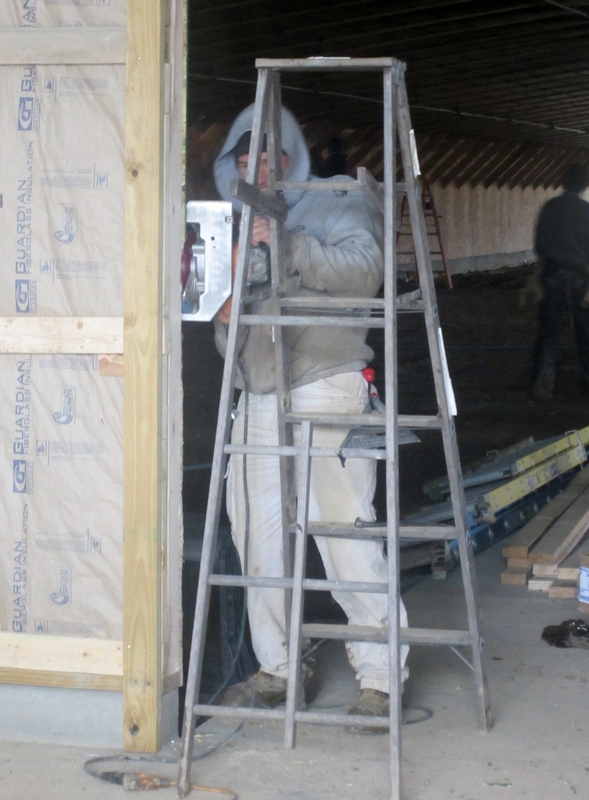 Pictured below is Bob, finishing the doorway that will separate the two sections of the breeder house. Each day we have more of the project checked off the list. Take a look at this shot of the hen house now. 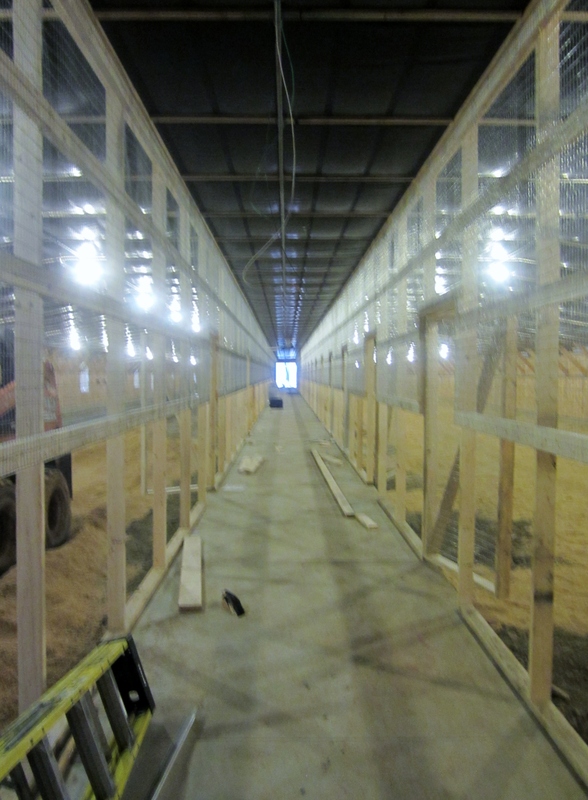 You’ll see we’ve installed the main pen walls down the center aisle and spread the very first bedding our flocks will walk on! Roll-out nest boxes will hang from these walls. The eggs will roll out towards the center aisle making egg collection a breeze! Speaking of nest boxes, we’re building those now. We came up with a custom design and had them manufactured just for our hens! We put them together back at the hatchery to stay out of the way of the non-stop construction back at the breeder house. 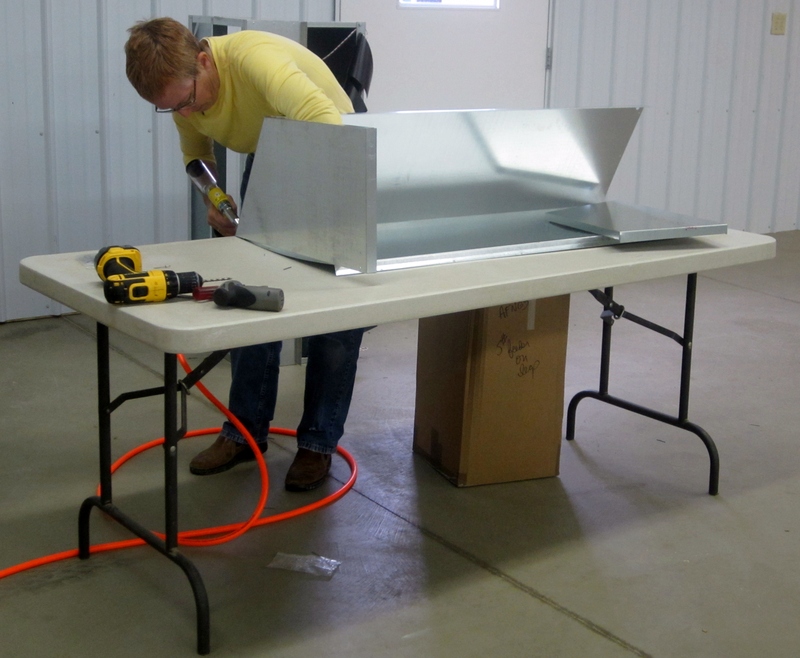 Here’s owner, Karen Meyer, assembling one, and then another…and another….and, well, you get the point. Check back soon for another update. Things are moving fast now! i really have enjoyed the rhode island red chicks i bought from u last spring they have matured very well i am looking forward to your next catalog too thanx johnny from s.c.
What kind of bedding do you use on the floor. Pine shavings. Same kind we sell in our store! any chance of these custom nest box plans being available? What you see is what you get. Even the employees haven’t got the blueprints!